There is always something exciting about Los Angeles. Is it the shiny cars and buildings or the idea that you may stumble across a famous person around the next palm tree? I am not sure, but the buzz of 15,000 “Speechies” at the ASHA Convention certainly helped us feel energized! 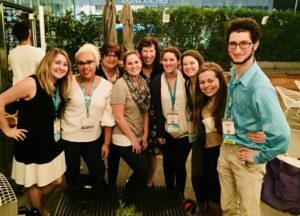 Many of our faculty and students presented at the Convention this year on a variety of topics. 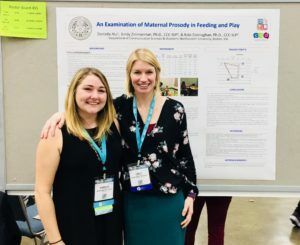 Dr. Emily Zimmerman and the students working in her Sensory Neural Lab had a number of posters on Infant Feeding and Maternal Wellness. Dr. O’Neil presented with MS SLP second year student, Alanna Kjoller, in her poster presentation on Memory Outcomes with Adults in various countries. Dr. Schlosser presented on Evidence Based Practice. Dr. Rupal Patel presented on a number of Motor Speech related topics as well as working at her VocaliD booth. 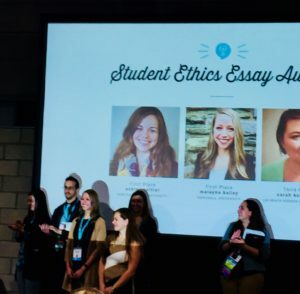 We are very proud of Ashley Peltier, BS/MS SLP student for her achieving First Place in the Ethics Essay Award from ASHA. 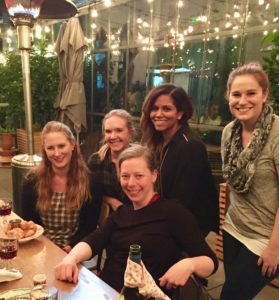 I was thrilled to host a wonderful West Coast BostonSpeechies alum get together at the cool new Line Hotel in LA. Our alum are all excellent SLPs working in a variety of clinical settings enjoying life to the fullest. We are so proud of you! Leaving LA with lots of new practice ideas and research in the field of speech-language pathology and of course the fabulous fun time with all my speechie friends!